Quarterly Reviews of Biophysics covers the field of experimental and computational biophysics. Experimental biophysics span across different physics-based measurements such as optical microscopy, super-resolution imaging, electron microscopy, X-ray and neutron diffraction, spectroscopy, calorimetry, thermodynamics and their integrated uses. Computational biophysics includes theory, simulations, bioinformatics and system analysis. These biophysical methodologies are used to discover the structure, function and physiology of biological systems in varying complexities from cells, organelles, membranes, protein-nucleic acid complexes, molecular machines to molecules. The majority of reviews published are invited from authors who have made significant contributions to the field, who give critical, readable and sometimes controversial accounts of recent progress and problems in their specialty. The journal has long-standing, worldwide reputation, demonstrated by its high ranking in the ISI Science Citation Index, as a forum for general and specialized communication between biophysicists working in different areas. Thematic issues are occasionally published. 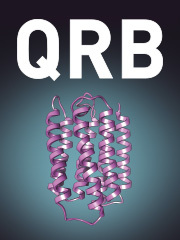 QRB Discovery (QRB-D) is vehicle for the rapid dissemination of exciting new developments in the field of biophysics. Situated in the prestigious Quarterly Reviews of Biophysics (current Impact Factor 7.242), QRB-D expands the title’s output to include Open Access original research. With an emphasis on the significance of discoveries, rather than exhaustive follow-up work, QRB-D’s peer review focuses solely on the quality and novelty of the findings presented. While reviewers may recommend further avenues of investigation, exploring these points will not be a barrier to acceptance. Complementing the section’s Open Access publishing model, all QRB-D papers will feature an Impact Statement, a brief take-home message which distills the key points and packages the work for improved discovery via social media channels. Further content enrichment options such as graphical abstracts and video summaries are fully supported and strongly encouraged.